New Zealand's Julie Brougham has been named as arguably the best Trans Tasman campaign by a Kiwi dressage combination in recent years. 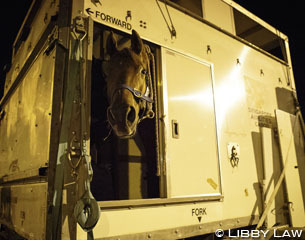 Julie and her 12-year-old chestnut Rhinelander Vom Feinsten headed off to Europe late last month flying with Australian Equine Transport Company, IRT. The pair are looking to be a hot combination after a great victory in March in the Grand Prix at the CDI Hastings Horse show of the Year, where they scored 70.745%, what is believed to be a New Zealand record. Chris Burke is head of IRT, a company that has been operating for over 40 years with bases in the USA, New Zealand and Europe. He has been in the shipping business for almost two decades. The pair landed in the Uk at approximately 8 pm after an extremely ambitious journey. Burke, who was in charge of the trip, said that all reports were that the trip went well, particularly as the horses were able to travel in a space and a half which is a great help. Chris notes that it is the experience that makes IRT stand out. With over 44 years of flying horses around the world, the IRT team have learnt a lot and are still always searching to improve their services. “We are implementing new improvements with every flight we do, and we move around 5000 horses a year through our global network," Burke added. With Rio on the horizon flights should be on the increase this year, but Chris confirmed that every year there is an event or race that causes a surge at different times. Through its global network it allows IRT to allocate resources where and when they need them. Burke recently attended the 10th International Equine Infectious Diseases in Argentina,where the world's experts on Equine Infectious Disease were brought together. IRT sponsors the event as they feel it is a very important one.